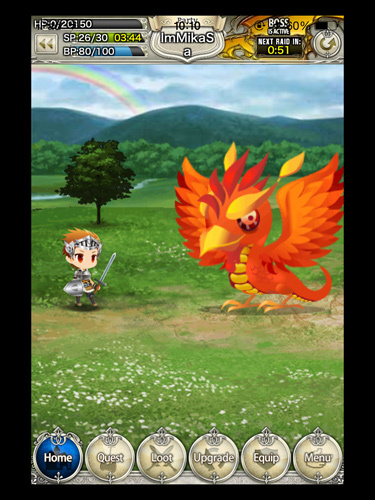 PlayNext’s latest title, Sword of Phantasia, has taken the cutesy mobile gaming route that is reminiscent of another mobile title, Final Fantasy: Airborne Brigade. The game however clearly deviates from Airborne Brigade on some key elements, mainly the focus on equipment gathering and boss monster raiding. But before I get a head of myself, read on to find out more about the game. 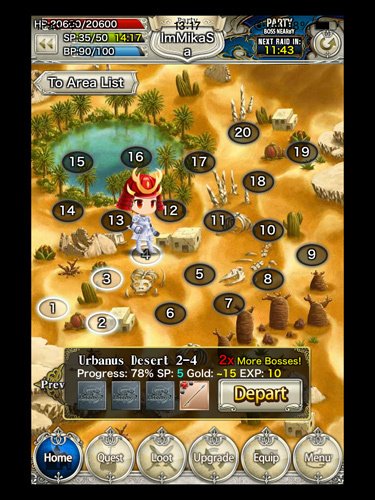 Sword of Phantasia follows the typical mobile MMORPG gameplay with your character going through areas that contain a fixed number of instances. The game uses the energy system to track/limit the amount of instances you can go through per run. You regain energy every five (5) minutes in real time. Similar to other titles that also use this system, the energy cost increases as you continue further into the game. Adventuring nets you a random chance of facing monster mobs, finding chests, or stumbling into a boss monster. Each instance has a set amount of loot that you can get so that you can revisit stages after you’re done going through them. 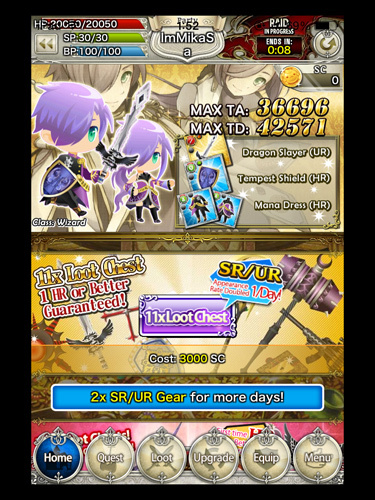 If there’s one thing that PlayNext seems to be selling in Sword of Phantasia, its loot, loot and more loot. To be fair, the game doesn’t have anything new or innovative in terms of the loot drop system, though they are far more generous with drop rates than your average title. A possible reason for this may be because the game uses equipment (armors/weapons) as your character’s overall attack/defense stat. You can equip a certain number of armaments at a time. 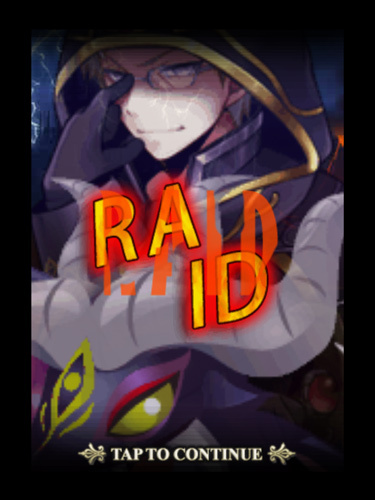 However you are limited by stat requirements that keep a low level character from getting lucky and becoming godly too quickly. 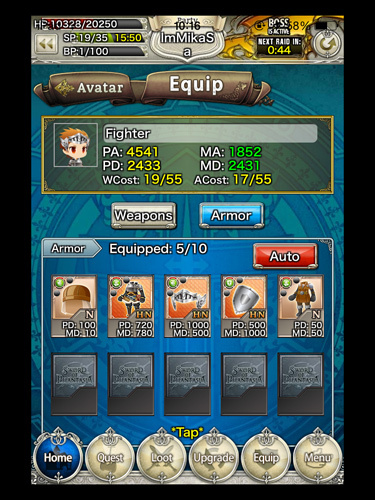 The other notable element in the game’s equipment system is that you can assign an equipment to be show as your character’s clothes in-game. 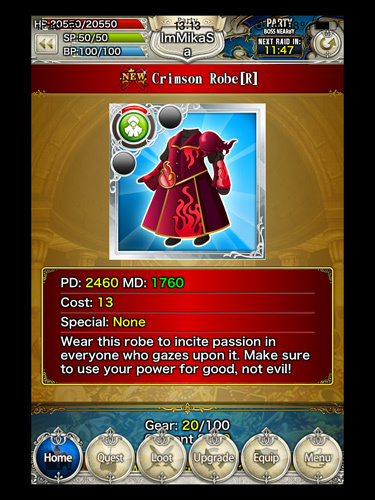 In fact there’s an in-game event dedicated for showing off the best attired characters. Sword of Phantasia also uses the upgrading/refining system in other titles. 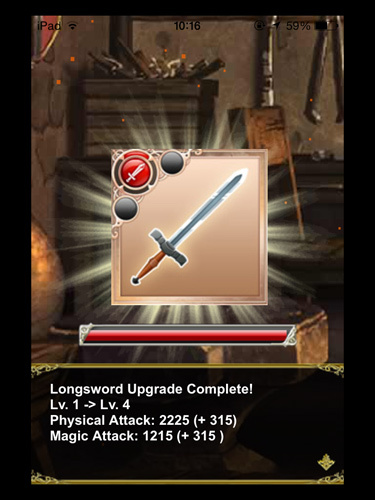 This means that each weapon has its own level that you can increase by sacrificing your excess weapons or equipment. On the other hand, refining requires you to sacrifice the same weapons in your storage to increase its stats and rarity. Boss monsters in Sword of Phantasia are random encounters during your adventuring phase that requires you to get help (normally) from other players. 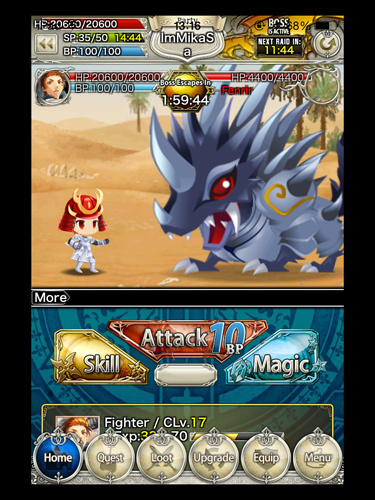 Facing boss monsters uses a different gauge from your character called Battle Points. BPs are required whenever you do an attack, a spell, or heal yourself in encounters. 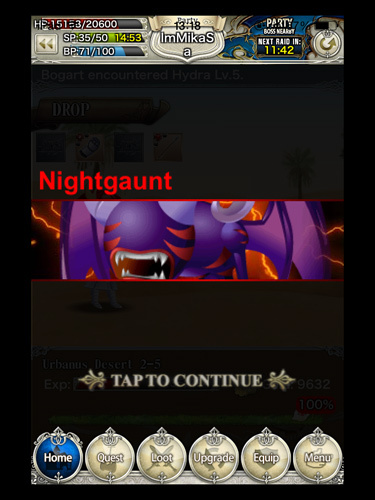 The game tosses you a random leveled boss monster so the levels of the boss monster you’ll be facing can go as high as level 90 or as low as level 1. Another thing to take note of when facing boss monsters is that it you are required to defeat the monster before a set time duration expires. The amount of time given per each monster encounter is dependent on the level of the boss monster you are facing. The higher the level, the longer the escape time is given by the game. Boss monster encounters also setup the game’s social aspect features. Since the game requires you to ask for help (and be rewarded with gold if you do), you’ll be immediately introduced to a set of people as your party mates. You can then stay in communication with your party mates whether you need further help or just want to drop a thank you for a well-timed heal. The game also cycles through a wide variety of boss monsters, so things don’t feel repetitive for quite a while. Some monsters require different approaches as well, adding a deeper level of depth than most mobile games of its type. Another good game feature Sword of Phantasia has is its job class accessibility. You can in fact switch between them on a whim. Each class must be leveled individually though, so some effort will need to be put into one before you can expect to provide decent support in group content. Another enjoyable thing about leveling different classes is that your character can also learn skills that your character can equip. This provides your character a lot of skill options for taking down boss creatures. 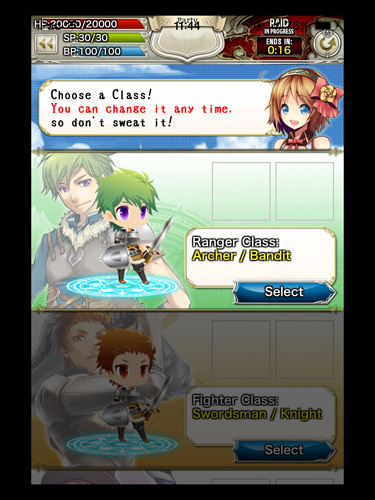 The job class system in fact is reminiscent of Final Fantasy’s system to the point of being borderline identical. However, Sword of Phantasia has enough running on its own that the game would not be mistaken as another FF rip-off. Sword of Phantasia is a nice game to spend a few hours a day playing. It doesn’t hurt that the game also looks cute and the bright colors really make the game pop out as you play. The problem however is the game’s childish approach might limit the population of people willing to give it a try. All in all though if you like the cutesy graphics or are willing to overlook them, the game is a really enjoyable romp. 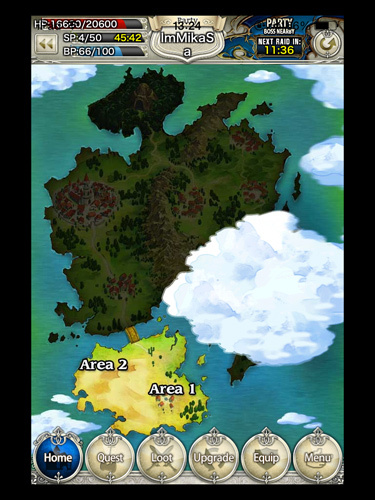 Sword of Phantasia’s streamlined to be played in the mobile platform with a user interface ideal for small screens, offering enough size and separation of buttons that you’ll seldom misclick an option or attack. While the game doesn’t bring anything new or innovative, Sword of Phantasia is fun and easy enough to get into. I enjoyed the clothing your avatar aspect of the game. Not only does it add a bit of customization other titles lack, it’s fun seeing my character in action in his thematic mish-mash of armors and weapons. While this isn’t a mobile game I’d place on my “must have” list, it’s entertaining enough to spend a week or two on. Especially if you’re looking for a game that you can easily pick up to pass time this summer vacation. Hope stays alive for EU in Group Stage Day 6!